The belief that consumers crave more targeted, personalized ads has become a digital advertising mantra. But itâ€™s not entirely true. Sure, there are a slew of studies by trade groups and retail and marketing vendors showing that â€œrelevantâ€� ads increase engagement and purchasing. Privacy and security concerns are likely a major reason, but respondents also indicated that tracking and targeting werenâ€™t giving them a relevant experience: Just 29% of RSA's respondents agreed that handing over their data resulted in better products or services, down from 31% the previous year. These findings are similar to those in a recent report from Pew Research Center. More than half of the US Facebook users surveyed by Pew said they were â€œnot veryâ€� or â€œnot at all comfortableâ€� with the social giant tracking their activity to compile their â€œad preferences,â€� and most other respondents were ambivalent. 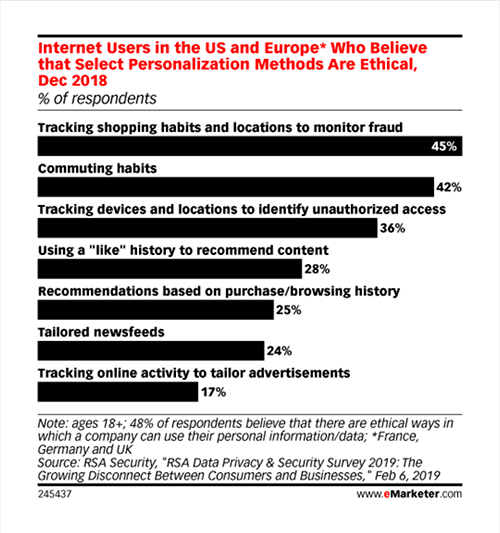 The Pew and RSA surveys align with years of research in which consumers have consistently stated that they donâ€™t want to trade their personal data for more relevant ads. A 2017 Mumsnet poll of its UK readers showed that two-thirds of respondents were unhappy to see targeted advertising based on either their online behavior or on data they had given an advertiser. Pew Research Center found in 2016 that most people didn't want to trade data privacy for more targeted ads. In a 2012 poll of US adults by the Annenberg School for Communication at the University of Pennsylvania, 61% didnâ€™t want to be shown ads tailored to their interests. That followed a 2009 version of the poll where two-thirds had said the same. 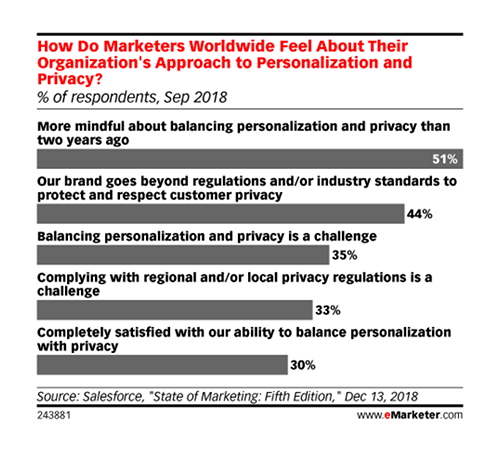 Even if advertisers remain convinced relevance is the answer, September 2018 polling from Salesforce found that more than half of marketers worldwide claimed they were being â€œmore mindfulâ€� of the balance between personalization and privacy than they had been two years earlier. Copyright 2019 eMarketer inc. All rights reserved. From https://www.emarketer.com. By Ross Benes.